The new leasing standard becomes effective in fiscal years beginning after December 15, 2018, including interim periods within those fiscal years, for: • Public business entities • Not-for-profit entities that have issued (or are a conduit bond obligator for) securities that are traded, listed, or quoted on an exchange or an over-the-counter market• Employee benefit plans that file financial statements with the US Securities and Exchange Commission (SEC). For all other entities, it becomes effective in fiscal years beginning after December 15, 2019, and interim periods in fiscal years beginning after December 15, 2020. Early adoption is permitted at any time for all entities. The primary purpose of the standard is to address the current accounting treatment of operating leases which are deemed to be off balance sheet financing arrangements and are only disclosed via a company’s financial footnotes in the “Commitments and Contingencies” footnote. Upon the adoption of ASC 842, Therefore, for every identified lease, companies will be required to create a lease liability calculated as the present value of the future fixed payments and a corresponding asset (“right of use” asset). The right of use asset will be amortized over the life of the lease. The income statement will be impacted by a straight-line lease expense item that would essentially contain an interest component with the amortization of the asset being the plug-in order to achieve straight line lease expense over the life of the lease. One of the key challenges of adopting the new standard will be for companies to assess and apply the incremental borrowing rate applicable to them which will be used in the present value calculations for the capitalization of lease liability and right of use assets related to leases. 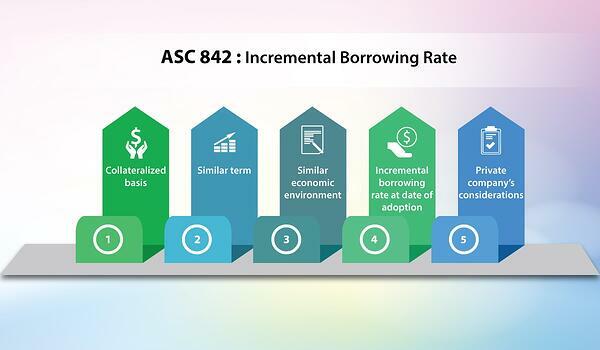 ASC 842 defines “incremental borrowing rate” as: The rate of interest that a lessee would have to pay to borrow on a collateralized basis over a similar term an amount equal to the lease payments in a similar economic environment. The definition of “incremental borrowing rate” in ASC 842 represents a change from how that term was defined under ASC 840. The definition under ASC 842 makes it clear that the lessee is required to assess the rate as a secured rate. Under ASC 840, a lessee was to determine a rate that was “consistent with the financing that would have been used in the particular circumstances,” which could have resulted in the lessee using an unsecured borrowing rate. Accordingly, if a lessee used an unsecured rate to determine lease classification under ASC 840, the adoption of ASC 842 should result in it utilizing a lower discount rate for determining whether the lease qualifies as an operating lease. When combined with other changes from ASC 840, there is a greater chance that leases classified as operating leases under ASC 840 will be finance leases under ASC 842. In determining the incremental borrowing rate, a “one size fits all” will not be sufficient to be compliant with the new standard. 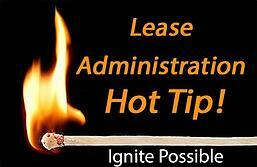 Therefore, companies will need to determine the incremental borrowing rate by average lease terms. For example, the incremental borrowing rate applied to a twenty-year lease should not be the same as the rate applied to a three-year vehicle lease. Many companies have asked whether it is possible to use the Company’s corporate cost of capital borrowing rate which is usually is at the company’s headquarters. As noted in the guidance, the incremental borrowing rate will have to applied to similar economic environments so wherein companies have corporate debt at the US headquarters they will be forced to assess and document the differences in rates in different economic environments such as in countries such as China, Brazil, Argentina and some countries in Africa where the economic environments are vastly different than in the Unites States. The incremental borrowing rate should be applied at the date of adoption which for public companies will at 1/1/2019. Companies should start to assess the incremental borrowing rates as early as possible and then update as needed for any changes to the terms and economic environments throughout 2018 so at 1/1/19, there is a clear and precise documentation of the methods used and assumptions made for the various rates. Because of the difficulty of determining the incremental borrowing rate, ASC 842 also provides a practical expedient to private companies by allowing those reporting entities to use a risk-free rate to determine lease classification. While the risk-free rate is certainly easier to determine than the incremental borrowing rate, the use of the risk-free rate could result in more leases qualifying as finance leases because the present value of the lease payments determined using the risk-free rate will be greater than the present value determined using the incremental borrowing rate. Accordingly, private company lessees will need to carefully consider the implications if they elect to use the risk-free rate. As companies start assessing the adoption and implementation, careful consideration of the incremental borrowing will need to perform because of the challenges in the new definition of the incremental borrowing rate under ASC 842. Companies should start having meaningful conversations with their respective treasury departments to determine the various rates that will need to be applied on 1/1/19.